J4YF Series: Young Parents Speak Out! Becoming a mom is life changing, no matter your age. It gives you a whole other perspective on what you will continue to do in life. I was 15 years old when I found out I was pregnant. I still remember school days being the worst: being looked at continuously every day, always trying to cover myself with a big sweater that obviously didn’t help, walking across my high school campus exhausted and always wanting to cry, waiting for that bell to ring to go home to lay on my bed until the next morning. It repeated every day. During that time, I was in a place where I was struggling and in pain by being in a relationship I knew wouldn’t work. I knew I wouldn’t be respected. It felt like because I made a child with this person I would have to be with them for the rest of my life. It wasn’t until my son was less than a month old when I just couldn’t take the disrespect anymore that I became a single mom. Since then, my son became my top priority. I finished my sophomore year and entered now as a junior with honors and an AP class. Society automatically perceives me as being dumb, bad and an irresponsible mom because of my age. It’s unfair to be seen like that because there are a lot of hard working young parents I know that do a lot for their children. Not all young parents are the same, we don’t all have the same story. In school, I hear students and teachers shame young parents. I had learned to ignore it but now I’m learning how to stop it, to not only stand up for myself but for others. I’m proud that I get to tell myself I’m a strong, hardworking mom. I think it takes a lot for someone to say it to themselves and actually believe it because I’ve been there. In the beginning I dealt with depression. I’ve changed a lot mentally and being able to recognize myself as a good young mom feels really great. I’m choosing to continue my education and go to college because my goals for my family include being able to obtain a job I will love helping young parents. There are days where I do want to quit and I’m tired of being so exhausted at school, yet I find myself still moving forward. I don’t feel like the rest of my peers and it’s hard for me to be friends with someone because of how different I am mentally compared to them. But it’s okay. I just hope for the best and wish my future self a lot of luck. About the author: Maria is a Justice for Young Parents (J4YF) 2016 Young Parent Leaders Council (YPLC) member from Madera, CA. Her blog post “A Force of Nature” was selected for first place in CLRJ’s first J4YF blog contest by a group of peer young parents part members of the YPLC Advisory Committee. 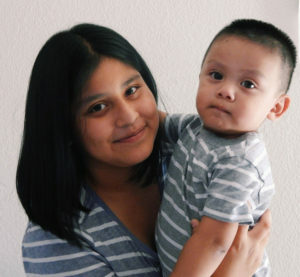 Maria is also part of Planned Parenthood Mar Monte’s Teen Success Program. Don’t forget to join our partners Young Women United for this year’s #RepectYoungFams Twitter Chat Thursday August 25, 2016. Join the J4YF movement click here! © Copyright 2018 California Latinas For Reproductive Justice. All Rights Reserved. By IMO MEDIA INC.